Scenario 1: You have 2 lookup fields on a form and one of those lookups should be filtered based on the other. 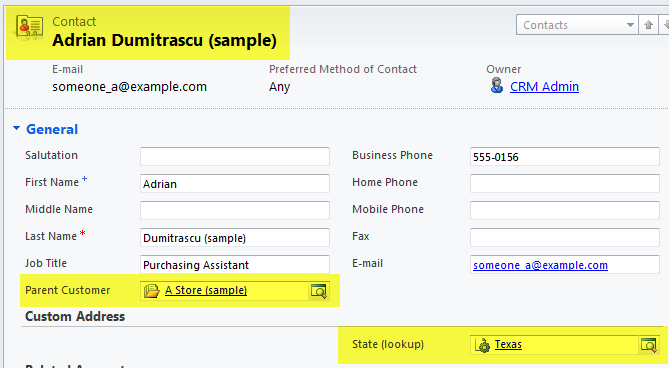 Example: On the Contact form you add 2 new lookup fields, one for “Country” and one for “State”. They map to 2 new entities: Country and State, where the Country entity has a 1:M relationship to State. On the Contact form the user selects Country first and then when they select State the lookup should be filtered to only show the States that relate to the chosen Country. The terminology employed here doesn’t read right to me, the fields feel like they’re placed upside down. What we want is “Only show (State) records where the Country value of the State contains the Country value specified on this Contact record”. My suggestion is swap the fields in your head as you read the screen or don’t read the screen – instead just think of the first picklist as defining the input parameter and the second pick list as defining the field you want to filter on. Scenario 2: The same entity is represented twice on one form as 2 lookup fields. 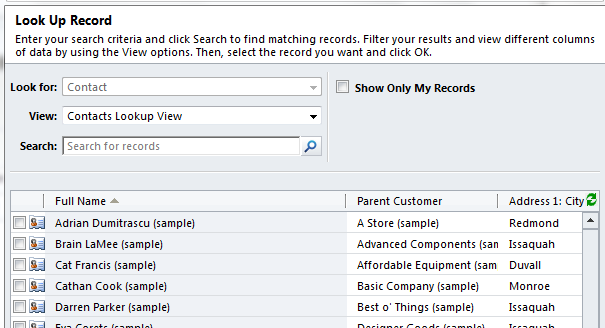 Each lookup field should offer a different subset of records for the user to pick from. 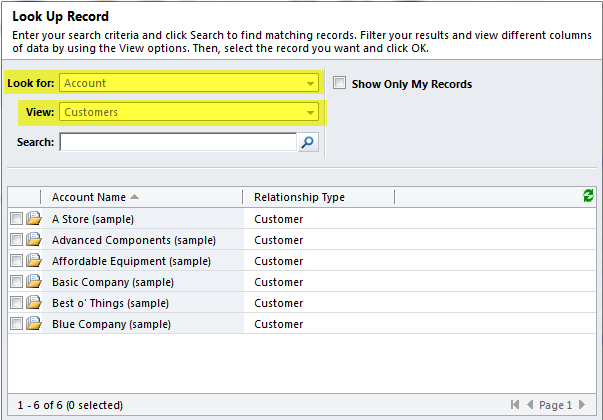 Example: The Account entity is used in CRM to store both Customers and Suppliers with the Relationship Type picklist on the Account form used to distinguish them. The Contact form has 2 additional lookup fields to the Account entity, one labelled Customer, the other labelled Supplier. The Customer lookup should only show Accounts of type “Customer” and the Supplier lookup should only show Accounts of type “Supplier”. Solution: There are 2 approaches to this, 1 simple, 1 complex. 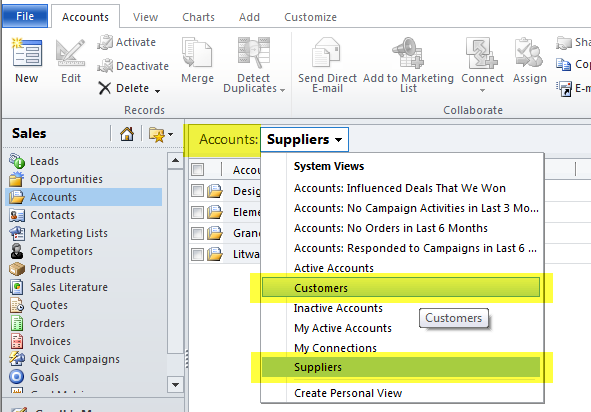 The simple solution is to define 2 system views on the Account entity, 1 that only shows Customers and 1 that only shows Suppliers. Then on the Contact form you assign the relevant view to each lookup. Easy. So this approach works fine in most simple scenarios. The downside is that the 2 system views created to support this are visible throughout CRM. In this scenario that’s probably not a big deal, the 2 views may be useful to end users, but once the volume of views increases things start to get messy. var viewId = Xrm.Page.data.entity.getId();      // Your new lookup views needs a unique id. It must be a GUID. Here I use the GUID of the current record. 1) The view ID that you assign to your new view must be a GUID value. 2) In the form designer make sure your lookup field has "Show all views" set in its "View Selector" property. 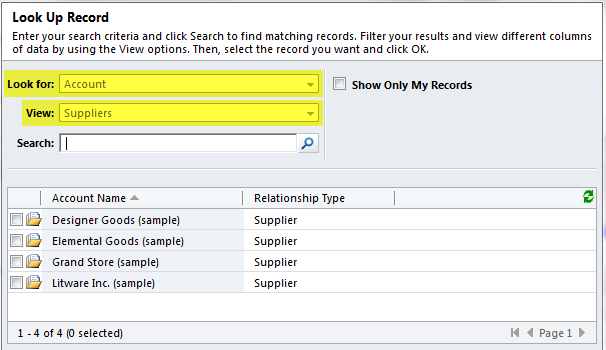 Scenario 3: A lookup field needs to be filtered based on a lookup field that resides on a related record. Example: The Account form has a Country field, the Contact form a State field. When selecting the State on the Contact only those States related to the Country specified on the Contact’s parent Account should be offered to the user. – Execute an ODATA query along the lines of: “Select the Country field from the Account entity where the Account’s GUID = this Contact’s Parent Account GUID”. – Once we have that Country value we can then dynamically create a new view and assign it to the State lookup field on the Contact form just like we did in the last scenario. var viewId = Xrm.Page.data.entity.getId();              // Your new lookup views needs a unique id. It must be a GUID. Here I use the GUID of the current record. Note: Because I’m following an oDATA approach this jscript needs the jquery and json2 libraries loaded into your CRM instance as web resources and needs those web resources referenced on the CRM form. I talk more about these prerequisite steps in an earlier post. The more I play with filtered lookups the more evident it becomes that all you are really able to do is improve the user experience, you are not able to effectively implement any sort of validation control, there are too many loopholes that will allow users to pick values that disobey the default filtering behaviour. So, in addition to configuring your filtered lookups you really need to build out validation rules, either via jscript or Plug-in. 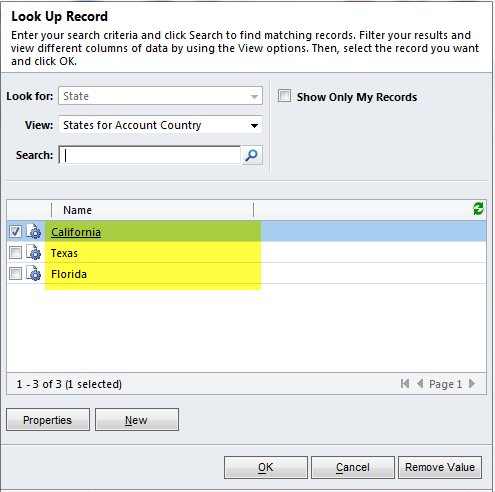 This entry was posted in Uncategorized and tagged 2011, crm, filtered lookups, oData, REST on March 22, 2011 by Gareth Tucker. 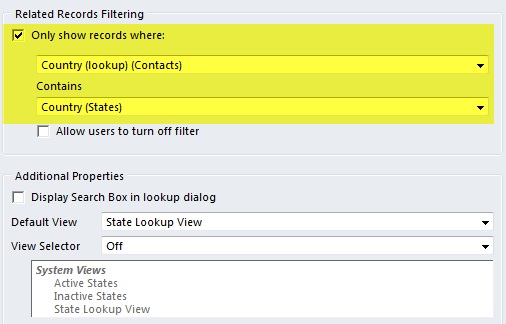 Here’s a quick example of configuring a filtered lookup in 2011. In this scenario we want to be able to specify on an Opportunity who the Key Customer Contact is and when selecting this Contact we want the lookup to only offer up the Contacts attached to the Opportunity Customer. a. 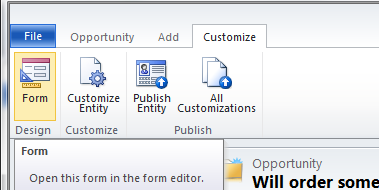 Open the Opportunity form, click on the Customize ribbon tab and then click Form. The Form Designer will launch. b. Click the New Field button. The New Field dialog will display. 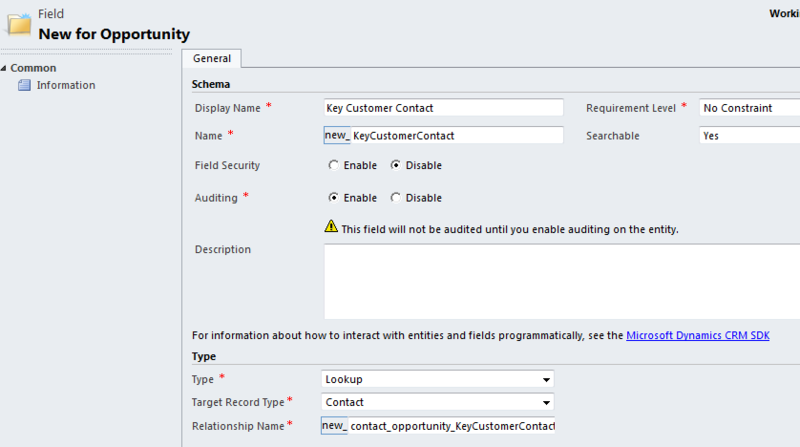 c. Enter “Key Customer Contact” as the Display Name for your new field, select Lookup as the Type, and then select Contact as the Target Record Type. Save and Close. The field will be created and you will be returned to the Form Designer. 2. At this point you might like to test things, so do a Save & Close of the Form Designer – you will be returned to the Opportunity form – click the All Customisations button on the Customize menu, and then refresh your browser window. 3. Ok, let’s now add the filtering. Open up the Form Designer again (click on the Customize ribbon tab and then click Form). 4. Double-click on the Key Customer Contact field – the Field Properties dialog will display. Note: there is no related record filtering going on. 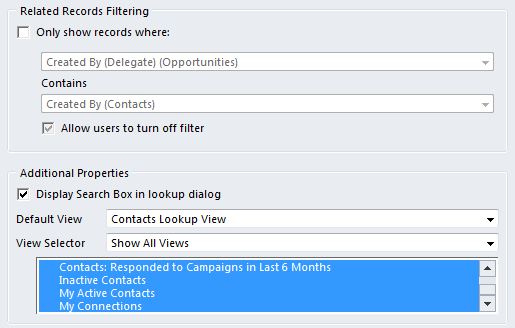 The lookup dialog is set to display the “Contacts Lookup View” with other all other Contact views able to be selected and the Search box enabled. 7. Next, we need to specify the source value from the Opportunity record to pass into the lookup and the destination field on the Contact entity on which to filter. In our scenario the source value is the Potential Customer field on the Opportunity form and the field on the Contact on which we wish to filter is the Parent Customer field. Finally, some words of caution on this feature – the filtering is only applied at run time as the user is populating the lookup field, it is not enforced after that point. i.e. If having selected a Customer and a Key Customer Contact you then change the Customer field the Key Customer Contact field is not re-validated, CRM will allow the field to retain a value that would not be offered up by the filtered lookup. Think of this feature as a helper for your users, not as means of enforcing data integrity. For that level of control you will need to consider some jscript or plugin code. This entry was posted in Uncategorized and tagged 2011, crm, filtered lookups on February 3, 2011 by Gareth Tucker.